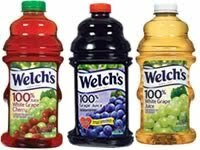 Hot $2 off Welch’s Grape Juice coupon! Go here to “Like” Welch's on Facebook and you'll be able to print a coupon for $2 off one 64-oz bottle of juice! You can only print one, but still, this is a great coupon!! You must click “Like” to gain access to the coupon, which is under the Promos tab. Coupon expires 30 days from print. Welch's juice is on sale for $2.99 at Smith's this week, so only. 99 after coupon! This entry was posted in A Uncategorized. Bookmark the permalink. Screamin Coupons Deal of the Day: 50% off Gloria’s Little Italy! Free Nivea Samples & more! Safeway also has a $1.00 Safeway store e-coupon that can be stacked with this printable for a total of $3.00 off. I am not sure what the price is at Safeway right now but Im thinking with both the printable and e-coupon it should be some cheap juice 🙂 Thanks for sharing! Save 50% off Glover Nursery!